SEATTLE--(BUSINESS WIRE)--Jun. 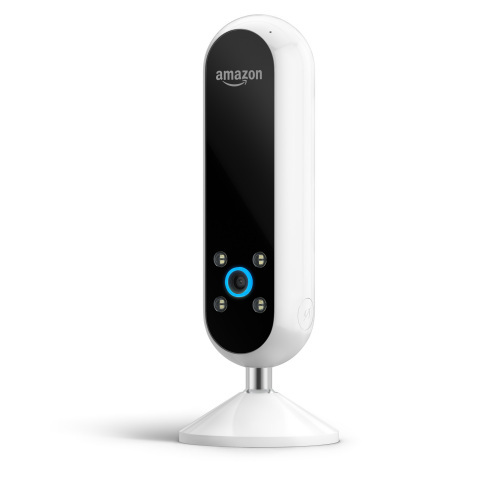 6, 2018-- (NASDAQ: AMZN)—Alexa helps you look your best with Echo Look, a first-of-its-kind Echo device with a hands-free depth-sensing camera, built-in LED lighting, and computer vision-based background blur to make your outfits pop. Simply say, “Alexa, take a photo” or “Alexa, take a video” to get a share-worthy shot of your look, no smartphone camera or mirror required. Alexa on Echo Look is the style assistant that gives you personalized recommendations, helps keep your closet organized, and provides fashion inspiration. Features like Style Check, Collections, and suggestions of new pieces to complement your existing wardrobe all come with Echo Look (#echolook), which is now available to all customers for $199.99 at www.amazon.com/echolook. Alexa as your style assistant on Echo Look uses a combination of machine learning algorithms and advice from fashion specialists to provide personalized recommendations. Style Check, one of the most popular features on Echo Look, gives you a second opinion on which of two outfits looks best on you—simply submit two photos and, in about a minute, Style Check will return a recommendation based on fit, color, styling, and current trends, plus an explanation of why one is better. One of the newest features on Echo Look will suggest items that pair well with clothes you already own to help you get more out of your closet. Recommended items are all shoppable on Amazon.com. Echo Look also makes it easier to keep your closet organized. To keep track of your styles, use Daily Look—each photo or short video you take of an outfit is automatically added to a lookbook that you can browse for inspiration and tag with descriptions. You can also filter looks by color to easily find a specific piece or decide whether you need yet another black top. The Collections feature helps organize your closet by category for easy searching. The Echo Look app will automatically organize Daily Looks into groups including Favorites, Seasons, and Weather. You can then create your own personalized collections like outfits for your vacation, business trip, items to donate, and more. When you’re away from home, you can use the Echo Look app to keep capturing outfit photos so you’ll never forget what you wore, or where you wore it. The photos will appear in the Looks tab in your app, where they’ll be available to browse, edit, share, and submit to Style Check. And since fashion is all about getting inspired by the next trend, customers can get tips from Amazon, Vogue, and GQ right in the Echo Look app. Or you can tap into Community Voting to submit outfit polls to the Amazon Spark community for additional input and feedback from other customers who love fashion. Ask specific questions like, “Which is better for a summer wedding?” or “Is this appropriate for a job interview?” and see the votes in real time. Plus, Echo Look includes everything you love about Alexa. Simply ask for timers and alerts, the weather and news, and much more. You can also “share” Echo Look with one other person while keeping your lookbooks separate. Household Profiles allows you to register up to two accounts to your Echo Look and switch just by asking or, using Your Voice, Alexa can recognize your voice and switch accounts automatically when enabled—you don’t even need to ask. Echo Look made its debut at New York Fashion Week: The Shows in February, where Amazon partnered with Prabal Gurung. Amazon used the device to photograph the backstage action to design a digital lookbook inspired by the designer's Fall 2018 collection. In another collaboration, customers have also seen content from Vogue and GQ appear in the home screen of their apps offering links to fashion tips and trends on Vogue.com and GQ.com. Additionally, designer and stylist Rachel Zoe collaborated with Amazon to promote Echo Look in a recent episode of Real Life with Rachel Zoe, using Alexa as her style assistant in sessions with influencers Sheryl Luke, Natalie Lim Suarez, and Brittany Xavier. Echo Look (#echolook) is available now for U.S. customers for $199.99. For more information, visit www.amazon.com/echolook.